Americans need to internalize that Western interests are in danger of being attacked and destroyed by both foreign and domestic enemies. If political Islam is not stopped now in the Middle East, it will explode in the West. The mood in the Middle East is rapidly changing. The elation of the Arab Spring, which led to prosperity and an economic and social upturn in the lives of millions of Arabs, has now deteriorated into a sense that significant dangers are stalking the Arab-Muslim world. Arabic TV, especially Al-Jazeera, has been broadcasting programs asking if bloodshed is the only mission of Islam, and if jihad [war in the service of Islam] still motivates believers to invade other countries with abandon and indulge in worldwide slaughter. Given the current situation, the Middle East is obsessed with asking itself: Who is responsible for the Muslims' catastrophe? And what keeps us chained behind, while the rest of the world forges ahead in social, economic and technological progress? Needless to say, the imams do not blame themselves. They claim that to change the situation we need only more and closer study and practice of the Islamic faith. As always, our Islamic society, constantly at odds with itself, blames everyone for our misfortunes. In the days of the Prophet (S.A.A.S. ), we blamed the Jews of Khaybar in the Arabian Peninsula for our ills. Now the imams who head the militant Islamist organizations tell us that the Jews, a tiny people who pose no threat to the might of Islam, are responsible for all our ills and for all our failures. Islamic radicals, however, hate not only the Jews but also the Christians, who have become, we are told, our sworn enemies. Christianity, like Judaism, is also vilified. The history of our hatred for the Christians began with the Crusades, and over the years the same hated Crusaders became the hated European imperialists and the hated colonialists. The hatred for the Christian West is founded on a sense of deprivation, of humiliation and inferiority, of being threatened and exploited, all of which cast doubt on the eternal message of Islam as the only up-to-date religion, destined to rule the world and invalidate the other religions. The Islamic sages who interpret the will of Allah say that both Christianity as well as Judaism, while monotheistic, are anachronistic, and while temporarily they can exist — with the patronage of, and overshadowed by, Islam — eventually all Christians and Jews will convert to Islam. Islam's openly-stated desire to control the world is now light-years away from its current wretched plight. The Muslims' low self-image not only makes us self-destructive, but leads to the desire to destroy anyone who succeeds, even if it means destroying ourselves as well. The unique prosperity and power of the Jews in Palestine, compared with the slaughter, poverty and backwardness of their Arab neighbors, create antagonism, jealousy, rage and an increasingly murderous desire for "revenge" among Muslims still under the heady influence of the Arab Spring and incited by the sheikhs of the Muslim Brotherhood. The imams in the mosques brainwash the masses, claiming that Islam's real enemies are the Christians, "the Crusaders," manipulated by the Jews who control them. Attempting to fool the leaders of the Christian West and weaken Israel, the Islamists sugarcoat the real situation and tell the Christians that all they have to do is solve the Palestinian problem. Once that has happened, the artificial Jewish existence in Palestine will come to an end, the entire Middle East will metamorphose into paradise and blossom, and everyone will live in harmony forever. Unfortunately, many Europeans have swallowed this tale whole. In the meantime, however, when not speaking to the West and telling each other the truth, the Islamists repeat the ancient adage, "We will begin on Saturday and finish on Sunday," that is, first we will get rid of the Jews and then we will get rid of the Christians — as we are seeing now in Nigeria, Iraq and especially Egypt. When it comes to theology, Islamist theologians claim the Jews distorted the Torah to conceal the future mission of Muhammad, and those same theologians have nothing but contempt for the Christian belief in the Divine Birth. In the meantime, because of regional Middle East chaos, the radical leaders of political Islam hide their true attitude towards Christianity and do not trumpet their plan to take over the world and rule it as Allah's chosen people; instead, they recruit eager agents among the Christians to make life miserable for the Jews. The radical sheikhs still mourn the loss of "Andalusia" — that is, Spain — as well as Palestine and other parts of the old Islamic empire that were lost, and now plan not only to restore Islamic rule to the lost territories but globally. Thus Islamic terrorists, inspired and goaded on by the preaching of their leaders, blow up planes, embassies, towers, subways and skyscrapers to cause untold casualties. Dispatched by their imams, they go on rampages of slaughter and bloodshed in the name of Allah, and brainwash and recruit Islamic youths as their successors to ensure future terrorism and violence. Much of the Islamist sheikhs' activity focuses on brainwashing within the Islamic communities in the West, where many have found a haven. There, they have formed enclaves where they nurture terrorism and violence, and,when the time comes, from where they will break out of their ghettos to overwhelm their tolerant hosts who generously and freely accepted them into Western Europe and America. The leaders of the Western world stubbornly claim, as the European Union did of Hezbollah, that there is a difference between religious and political Islamic leaders but these well-meaning Westerners will pay dearly for making the distinction. The West's political correctness and refusal to listen to and believe what the political Islamist leadership openly says — and its refusal to defend itself — will lead to catastrophe. For us Arabs it is not just wordplay: when someone tells you he means to kill you, he means to kill you. Innocence, willful ignorance and complete lack of understanding of both the Arab and Muslim mentality and its operational codes have misled the West into either patronizing Islamism and stupidly trying to dictate to its leaders, or into simply fearing it. Every single American attempt to bring Western-like democracy to the Arab-Muslim world has failed abysmally and led only to radical Islamist regimes as, for example, in Iran and Egypt. The same is true for the European declarations against the "undemocratic" involvement of the army in the government in Turkey. These brought on the Islamist regime of Erdogan, who jailed the Turkish army's senior officers, who had maintained the balance achieved by Ataturk in restraining radical Islam. The flight of the Americans from Yemen following intelligence warnings regarding al-Zawahiri and Al-Qaeda brought Al-Qaeda greater success than any genuine terrorist attack could have done. While the legacy of Islam and its Prophet are hardwired into the consciousness of every da'wah [religious outreach] activist, and dictate that all means — terrorism, violence, deceit — are justified to overcome the enemy, the Americans still seem to have incomprehensible trouble believing that radical Islam means exactly what it says. American impotence in the face of Iranian intransigence and renewed Russian power, as well as the lack of support for the Sisi government in Egypt, will lead to a regional disaster. America must give up its dreams of a democratic happy ending for the Middle East and start looking reality in the face. Once and for all, Americans need to internalize a fact: Western interests are in danger of being attacked and destroyed by both foreign and domestic enemies. The calls for America to ignore and distance itself from the events in the Middle East will eventually pave the way for a violent, full blown, powerful invasion of both Europe and the United States. If political Islam is not stopped now in the Middle East, it will, when the tipping point has been reached, explode in the West. It is no longer possible, when faced with the challenges of radical Islam, to pursue a policy of weakness or to support democratic processes which correspond only to American values. The Islamists have now started on Sunday: the Christians are in their crosshairs, and when they have finished, the Islamists will return to Saturday and destroy the Jews. The Zionists in Israel understand the threats of radical Islam and its intentions for their country far better than the U.S. administration will ever be able to. The Jews do not fear to show their determination and willingness to fight a life-and-death battle for their continued existence; it is that determination which has made the Islamists avoid confronting them for the present and target the Christians instead. What is unreal are the dictates America imposes on Israel, including the demand to release convicted murderers from jail and to reach an agreement with Mahmoud Abbas, who does not have the support of the Palestinian people. This approach will lead to a Hamas takeover of the West Bank and most likely then of Jordan; and it will destroy what is left of the Christian community in Bethlehem and east Jerusalem, whose members after the Oslo Accords and the withdrawal of Israel from the territories, were killed, raped and threatened into fleeing their homes. The Christians in the Middle East are in danger of annihilation. If the Islamic fanatics collaborating with the so-called "Free Syrian Army" overthrow Assad, the Christians, who are part of the minority coalition in the Syrian regime, will be subjected to an unimaginable slaughter that in all probability will spread to Lebanon. Thus in trying to stabilize the region, the West should reconsider its policies in dealing with Russia when it comes to Syria and nuclear Iran with its proxy Hezbollah. A tougher line also needs to be taken with Egypt. If the Muslim Brotherhood succeeds in overthrowing the provisional government of President Mansour and General Sisi, there will be a bloodbath not only of Western values but of the Copts — the original inhabitants of Egypt now being brutalized out of their historic home. Christians, who openly supported the recent events that ousted the Muslim Brotherhood's Mohamed Morsi, had their churches burned and believers killed by Muslims even years before the most recent events. 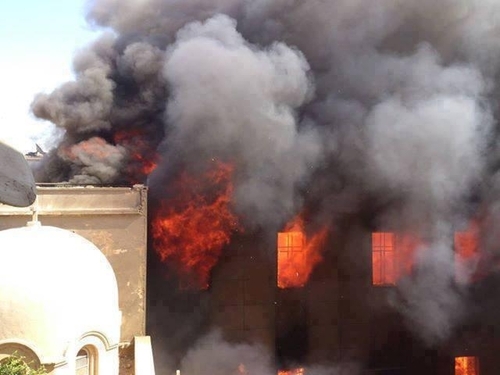 Now, museums and a tenth of the churches in Egypt have been burned. Morsi's followers do not forget that the Copts aligned themselves with the new government and against Morsi, and have recently begun beheading Coptic businessmen in the Sinai Peninsula, which was a tourist attraction when under the control of Israel. It is now a center for attacking the Copts, robbing them of their property and forcing them to flee. However, if Friday is dealt with properly, a more optimistic sun will rise over Saturday and Sunday.